Recently, I was given a very original gift. A box of dried mango slices (sabut amchur) and a heritage recipe from the late grandma’s recipe journal. This was my first trial with the dried mango slices. When the market is loaded with the abundant produce of kaccha aam (raw mango) the wise house ladies like my mother, slice them and later sun-dry the raw mango slices to preserve them. The raw mango slices which I received as a culinary souvenir were the last from the last year’s batch. So I decided to get a little adventurous with them and explore the sweet and spicy blends. This time of the year around summer, Sweet and Spicy Amchur Ki Launji is simmering in most of the kitchens of the neighbourhood. 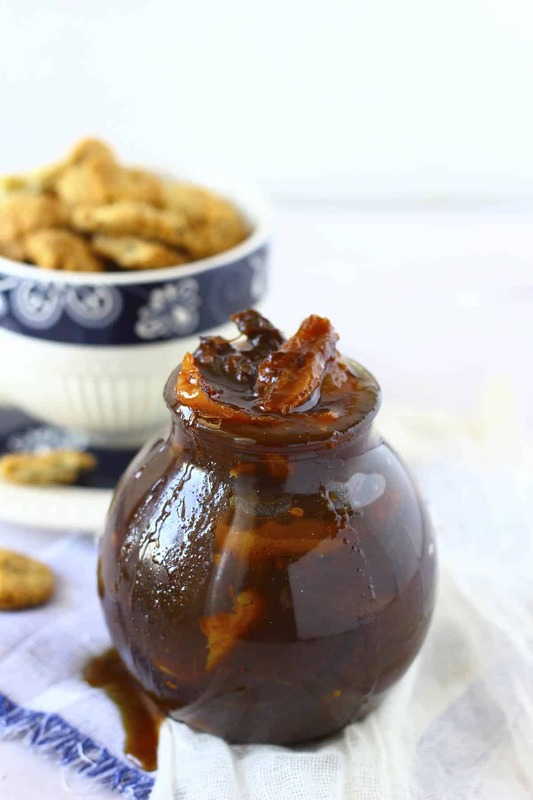 Ever since I was a child, Amchur Ki Meethi Chutney always fascinated my taste-buds. 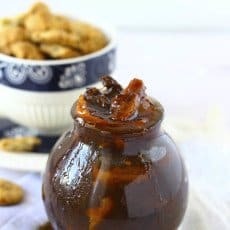 It is so hard not to scoop a chunk of launji from the jar using your fingers and lick it. But we used to relish Amchur Ki Launji in a refined manner as well by spreading it in between the Paratha or Puri. With dried mango slices soaked up in water and grandma’s recipe under my pillow, I could barely sleep throughout the night. I woke up extra-early the next day with only Amchur Ki Launji on my mind. The soaked amchur had turned into was perfect, gullible mash, ready to be given a sweet and spicy makeover. It turned out to be so easy, so beautiful to make, and on top of it, the house smells like sugar and spice. In an Indian kitchen, very rarely sugar and spice get to greet each other. Their segregated boundaries are pre-defined. But that’s a misconception. To inaugurate the sweet and spicy #foodventures Amchur Ki Launji was the perfect recipe. 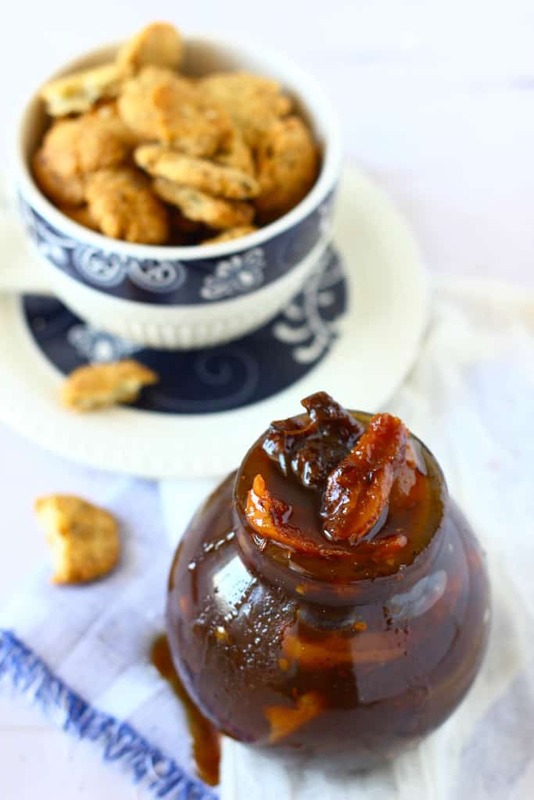 A good old-fashioned sticky and gooey Launji, similar to saunth, just how grandma used to prepare. Recently, when I saw the Sweet & Spicy #foodventure video, it reminded me of Sweet & Spicy Recipes that are a sheer outburst of flavours. 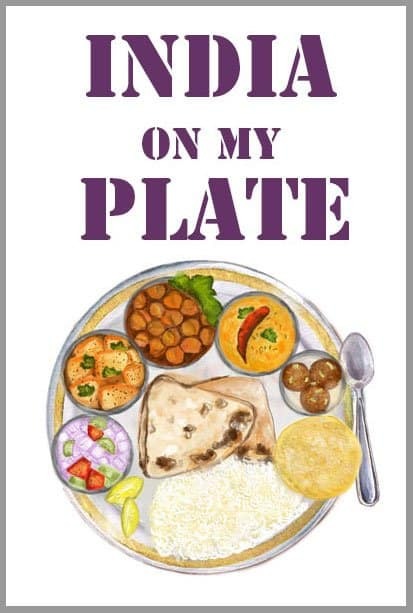 You can also become part of this flavoursome food adventures by sharing your sweet and spicy culinary tales with a dash of adventure on the website of #Foodventures. 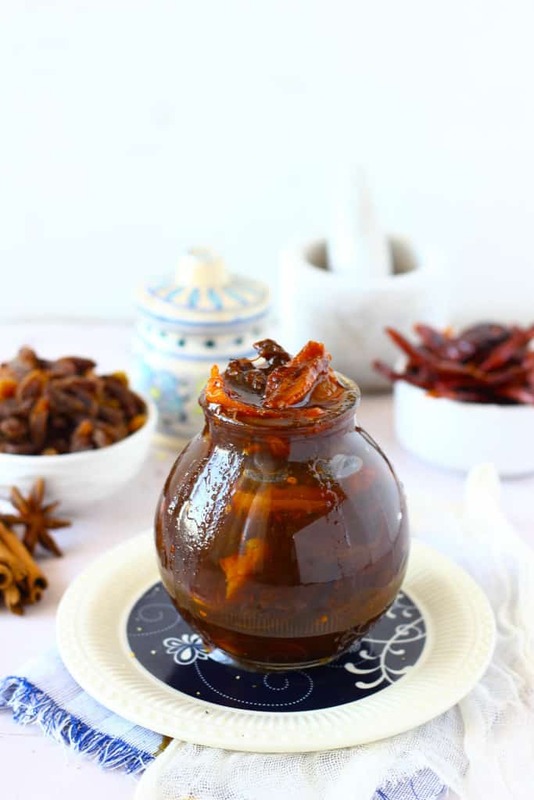 Amchur Ki Launji is a sweet and spicy chutney of dried mango slices. So good in taste. 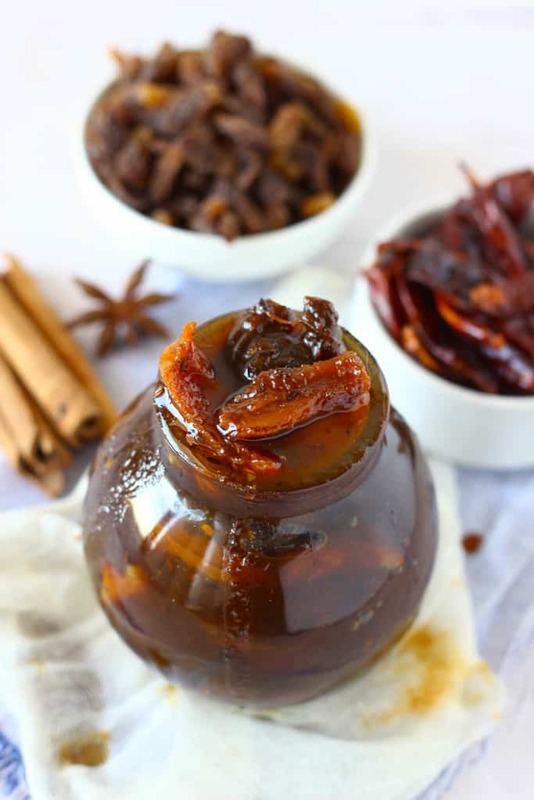 Learn how to make amchur ki meethi chutney in few simple steps. First soak dried mango slices (sabhut amchur) in 2 - 3 Cups of warm water overnight. Next day morning, drain the water from the amchur. Reserve the drained water as it will be added back in the launji at a later stage. Pressure cook the soaked soaked amchur with the 1 Cup of reserved water and salt. 1 - 2 whistles over medium heat are good enought to soften the amchur slices. While the amchur is cooking, in a pan dry roast the coriander fenugreek seeds. Pound the roasted seeds in a stone mortar and pestle. We are looking for roughly crushed seeds and not a fine powder. Set aside. Heat oil in a heavy bottom pan over medium heat. Add the cumin seeds, once the seeds release aroma add the red chilies. Fry for a minute. Next add the mango slices in the pan. Fry for 2 - 3 minutes over medium heat. Next add the raisins, ginger powder, red chili powder, crushed jaggery, date slices and the reserved water from the soaked amchur. Stir to combine. Add the crushed seeds of coriander and fenugreek. Stir and reduce the heat to low. Now let the Launji simmer till it reaches a one thread consistency, dark sweet and spicy syrup. It is always best to taste the Launji in the process of making and adjust the sweetness and spiciness accordingly. Keep on stirring occasionally in between. No need to add more water except the one reserved after soaking mango slices. Once the Launji is ready, let it cool down at room temperature. Store in an airtight, clean jar. If stored at right conditions, Amchur Ki Launji stays good for a year. Lovely write up Hina. Nothing can beat our mother’s recipes and wisdom. The Launji is looking too good.